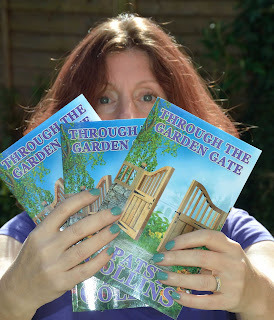 Welcome my guest this week, Patsy Collins, who's sharing her experience of creating print copies of her books (in addition to the e-versions). Thanks for inviting me onto your blog, Carol! It means I can mention that I've self published a kindle version of my new short story collection, Through The Garden Gate. It's available at the special price of 99p until19th April. Oh ... that's not why you invited me? That's right, I remember now. 1. It's nice to be able to hold your own book in your hands. Trust me, you'll feel a lot more like a proper writer when you do. 2. There are lots of people who don't use a Kindle and some of these might want to read your book. 3. Paper copies can be sold to libraries and they qualify for PLR and ALCS payments. 4. It's good to have physical copies if you give talks, both to show people and to sell. 5. Physical copies can get passed around. That doesn't help your sales, but might bring more readers (who might buy other books you've written). You never know who'll end up seeing a copy and becoming a fan. 6. Books make nice gifts or competition prizes. 7. You'll have done (or outsourced) all the hard work of writing, editing, formatting, proofreading, selecting a cover image and promoting for the e version, so there will be very little extra work involved. 1. It will take up a small additional amount of time. That time would probably have been used being annoyed by grammatically incorrect memes on Facebook, watching insurance adverts on TV, or something else equally worthwhile. Have I talked you into giving it a go? Hope so as I'll be back Thursday to explain how I created the paperback version of my latest collection. Great post. Thank you Carol and Patsy. I'm venturing into the self-publishing world later this year and I've been mulling over the print copy option. Still mulling but take on board your useful pros and cons (even though the cons aren't harsh at all). Thank you both. You've probably guessed I think it's worth it, Nicola. Trust me, Teresa - if it was really hard work, I'd only have the ebook versions. Looking forward to reading your next post, Patsy. I used FeedARead to publish my two collections and two tween books (when I got the rights back) so I'm interested in how you did it! I agree so much with your advantage number 1, Patsy. Holding a paperback and showing it off makes you feel like a 'proper' writer and I found that other people took me more seriously too once I had a physical product. I did look at FeedA Read at one time, Rosemary. I can't remember why I decided not to use them - it was quite a while ago. It is harder for people to be dismissive when you can whack them with your book, Sally. Not that you would and I only do it when provoked. Hope you'll read this Thursday's part 2 post for useful information and tips on the 'how' stage. Hope part 2 tomorrow will help you decide, Teresa. Sadly there are people who still feel this way, Sally. I published both my short story collections in print and am very glad I did. It was bought by many people locally (including members of my choir) and the local book shop stocked a few as well. I'd definitely recommend it. Another point, Wendy. There's the chance of sales to people who wouldn't usually buy books, but do because they know the author or feel a connection with them.